I’m sure you’ve noticed in your town that stencil graffiti has become rather popular. There is master stencil graffiti artist out there who uses the moniker “Banksy“. Apparently, when Banksy violates your property rights and besmirches the visual integrity of your building, your property value increases by $35,000 to $170,000! The work you see above seems far too simple to be a Banksy. On the third anniversary of Katrina, Banksy (who is from England) paid a visit to New Orleans to comment on the healing thus far. 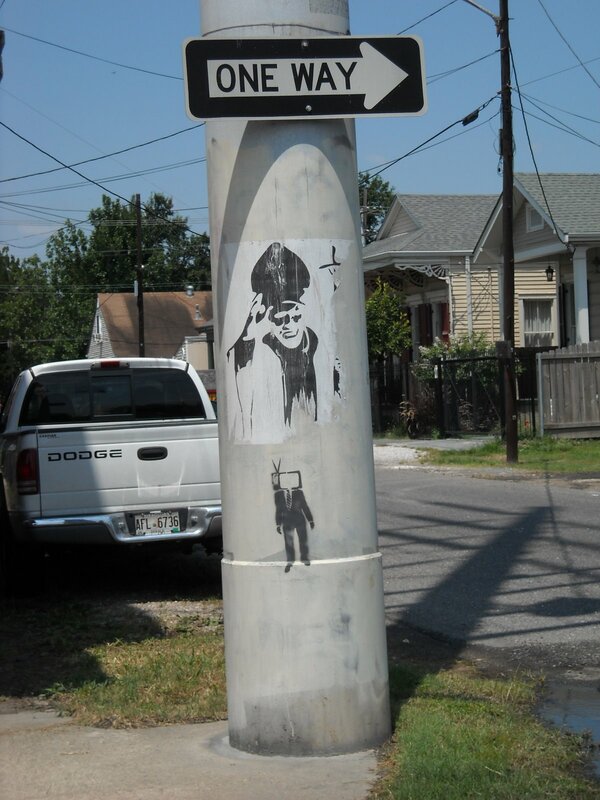 Also unbeknown to Banksy, New Orleans is home to a 52-year-old ex-Marine named Fred Radtke who has taken it upon himself to cover up any graffiti he sees with grey primer. This has earned him the name “Grey Ghost”. WELL, Radke has become somewhat of a large rock thrown with great force into a nest of already-angry bees. Not only did Banksy start targeting Grey Ghost specifically in his art, there was a public outcry against Grey Ghost (at least from the Arts community). A little presumptuous, arts community. Not only that, people are threatening to sue Grey Ghost for devaluing property (after it is increased by Banksy). Since he is in cahoots with the local Police, Military police have been brought in to deal with him. Some have taken to covering their walls with Plexiglas to protect Banksy’s work. Seriously, read it all here. Talk about being oblivious to drama unfolding within your community, unseen beneath your very eyes. 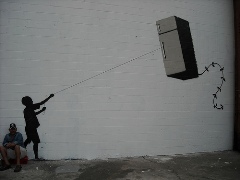 At any rate, Banksy has spawned many wannabes and copy-cats, especially since that kind of money is being mentioned. They’re coming to city near you if not already. Hell, I might try this on my own house, if it can get me an extra 10-spot on the resale. I imagine others will do the same. And thus, another art form becomes inbred and devalued.